In my Review of the Historical Accuracy of Thirteen Moons Charles Frazier mention bear grease numerous time, yet I was disappointed that he never once mentions the most common uses for Bear Grease, namely as a hair pomade and as a tool to forecast the weather. For those not familiar with Bear Grease, it has a most curious viscosity. At room temperature, bear grease is as thick as sticky as pine tar, yet at body temperature it becomes liquid. Bear grease makes for a marvelous hair dressing, as I discovered in childhood when I had to hide my long hair for a conservative social function where my long 1960’s mop would be an embarrassment to my parents. 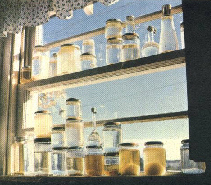 But Frazier forgets to note that almost every colonial American has a jar of bear grease as a weather forecasting tool. Bear grease is sensitive to changes in barometric pressure, and bear grease is quite reliable, provided that you know how to read it. The Bums of San Francisco! Is China planning war against America?